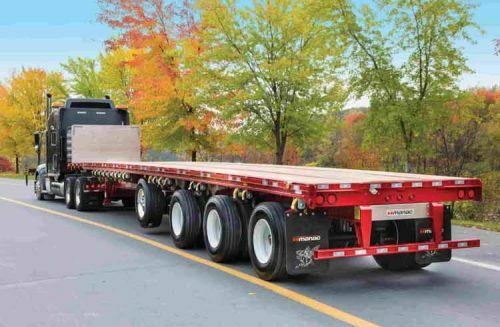 Flatbed Freight Shipping Services | KIngs Eagle Inc.
Flatbed is a type of trailer which can be either articulated or rigid. As the name suggests, its bodywork is a flat, level ‘bed’ with no sides or roof. This allows for quick and easy loading of goods. Consequently, we use them to transport heavy loads not delicate or vulnerable to rain, and also for abnormal loads that require more space than is available in a closed body. These types of trailers have a solid bed, usually of wooden planks. They are with no roof and fixed sides. To retain the load there are low sides, too, as a ‘drop-side’ truck. A ‘stake truck’ has no sides, but has steel upright pillars, which may be removable, again used to retain the load. Drivers who drive these type of trucks, must deliver perishable cargo in perfect condition and must pre-cool refrigerated units before loading the goods to ensure a stable and correct temperature. Kings Eagle Inc. provides flatbed trucking services in all states in the US and Canada. There’s no easier, more affordable way to take on the complex and physically tougher challenges of flatbed freight shipping than with our expertise. When you have a major project, our trucking services provide the equipment and operational flexibility to meet your specific transportation and logistics needs while maximizing each load. When it comes to flatbed moves, specially trained drivers and experienced operations staff make all the difference. Let us show you how we can deliver value for you while securely and safely handling your heavy-haul freight.Your goods move on an open-air flatbed trailer across dangerous terrain and in adverse weather conditions.In that case, you can rely on our extensive and reliable network of truck drivers to bring your goods to their destination safely and on-time.